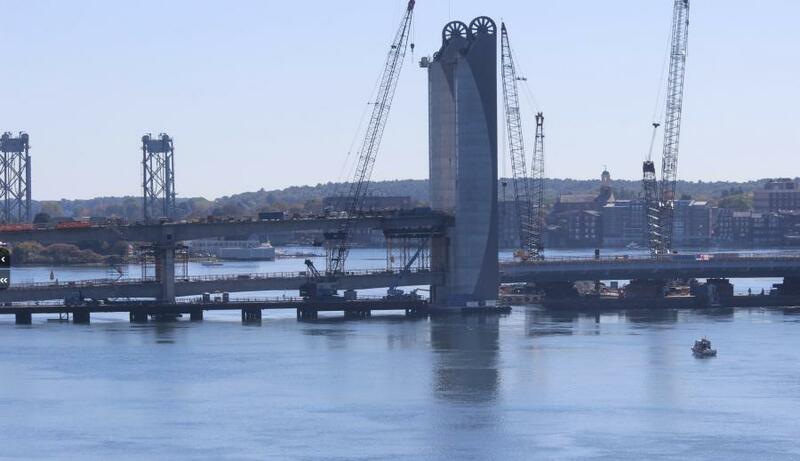 With help from the rising tide, the span will be lifted into place over its bearings, then around 11 a.m., the lift span will be lowered onto the bearings as the tide goes out, Maine DOT said. The center lift span of Maine's new Sarah Mildred Long Bridge was floated into place Oct. 18. The bridge piece travelled up the Piscataqua River between 6 and 9 a.m. Edge Radio reported. With help from the rising tide, the span will be lifted into place over its bearings, then around 11 a.m., the lift span will be lowered onto the bearings as the tide goes out, Maine DOT said. Finally, after the span is on the bearings, the barge carrying it will move away to the state pier, likely at 3:45 p.m., Edge Radio reported. Once it has been set in place, it will weigh about 2,000 tons (4 million lbs.). The steel box girder lift span will stretch 300 ft. long, and will be supported by two 100-ft.-tall towers made of precast concrete. Eight operating ropes made of steel cables will pull counterweights to lift and lower the bridge. The positioning of the new bridge will allow for better clearance at 56 ft., so bigger ships can get into the port and shipyard. As a result, there will be 68 percent fewer bridge openings than before, Edge Radio reported. The new bridge's construction began in January 2015 and is expected to be open to traffic in mid- to late November 2017, with completion scheduled for June 1, 2018. Check out some real-time videos of the bridge moving into place here.